A crisis in a democrazy occurs when an unstoppable force (Public) meets an immovable object (Government). 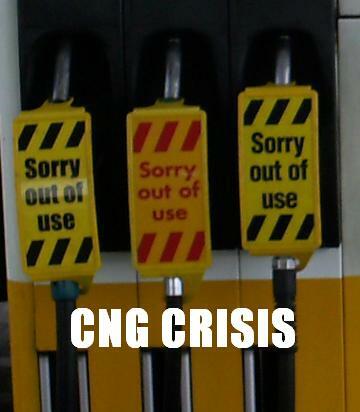 The CNG association of Punjab decided to go up against the government to call off the 2-day holiday of CNG and make the CNG available the whole week. But the government is an immovable object, so it knew and decided to not give up to their demands. While both of them called each of their own demands as legitimate, the consumers are the sore losers in this whole cat and mouse game. For once I agreed with the government when it decided to ‘preserve’ our natural resource which is a scarce commodity, through load shedding holidays but then I read the order sent out to all the rickshaw owners to convert their rickshaws to CNG. Another similar stunt was heard late last month from Sindh Minister for Transport Akhtar Husain Jadoon, at the 7th CNG Conference and Exhibition CONEX 2011 who said that all public transport will be converted to pollution-free and economical fuel – CNG. While one half of the country is craving for water, electricity, food, clothes, security, doctors, and a lot of other things available in a civilization, an addition to their misery is an indefinite CNG and petrol strike whereas in Sindh, the whole of public transport would be converting to CNG fuel. Byco Petroleum Pakistan Limited President Kalim Siddiqui said, “Pakistan cannot meet its rising energy demand without serious and consistent efforts on the part of the government,” he further added that Pakistan is facing gas shortage because it has failed to import gas through pipelines and has remained unsuccessful in importing Liquefied Petroleum Gas (LPG) and Liquefied Natural Gas (LNG) over the last 10 years and he warned that the government needs to come up with consistent energy policies – otherwise the situation will worsen. SSGC’s deputy managing director said criticized the way gas is being consumed in our country saying that we use 38 percent of gas in domestic and CNG sectors—which is the most inefficient use of this scarce commodity. And Sindh’s minister for transport found an inefficient way to curb environmental pollution using this scarce resource, lack of vision perhaps. According to the data collected by the public transport department, there are 2,598 buses, 5,935 minibuses, 3,372 coaches, 230 buses (KPTS), 42 buses (UTS-AC), 220 buses (UTS), 24,209 taxis (black and white), 23,095 taxis yellow cabs, 43,325 two-stroke auto rickshaws and 4,736 four-stroke CNG rickshaws. As I sat down to write on this developing story, I just can’t figure out what was going on, there seems to be zero coordination between federal and provincial government and also government to public sector, infact there is zero coordination amongst anyone because I just can’t understand why have the CNG stations went on an indefinite strike when they agreed with the government on 2-days CNG load shedding till 30th June. It was a bit unfair on reducing dealer’s margin on petrol from RS 1.75 to RS 1, then CNG load shedding and tons of other policies which are carried-out because they seem right to the powerful few but I must say that we are the sore losers in the end.